This vegan quinoa risotto uses white beans to make a rich, creamy & healthy dish. Flavored with shallots & thyme, it's perfect topped with roasted veggies. I’m sure most of you are already fans of Laura’s blog, The First Mess. If not, you should be – you’ll love it. 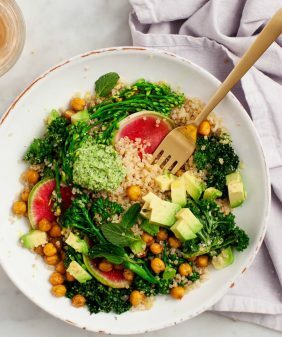 Laura and I both started our blogs around the same time, and I’ve loved her creative, plant-based recipes ever since. 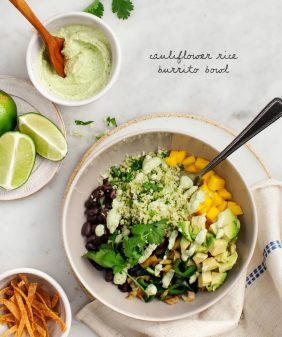 I’m so excited to share this recipe from her new cookbook today. 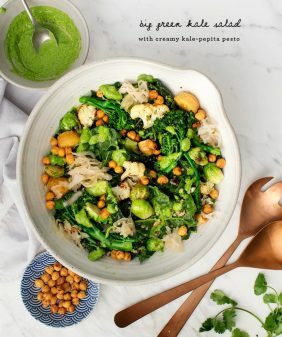 The First Mess Cookbook came out last week and I have to tell you – it’s a stunner. I saw an early PDF copy months ago, and I not only drooled over every single page, I read it (virtual) cover to cover. I especially loved all of her little tips and tricks, like how she makes homemade almond milk by using almond butter so that no soaking or straining is involved – genius! You’re gonna want to make everything – Cookies for Breakfast, Savory Ginger Green Onion Crepes, and she even has a recipe for Earl Grey Vegan Tiramisu that I’m dying to try out. Laura has a way of combining ingredients in such unique ways. This is a fun twist on risotto. In her book, Laura talks about disappointing quinoa risottos she’s had at restaurants in the past (since quinoa isn’t very creamy), which led her to create this recipe. It mixes a white bean puree into the quinoa to give the risotto necessary creaminess. There’s no butter, no cheese, and also… no standing at the stove stirring for a lengthy amount of time like most risottos. While it’s not a full-on risotto replacement, it’s so wholesome and delicious. 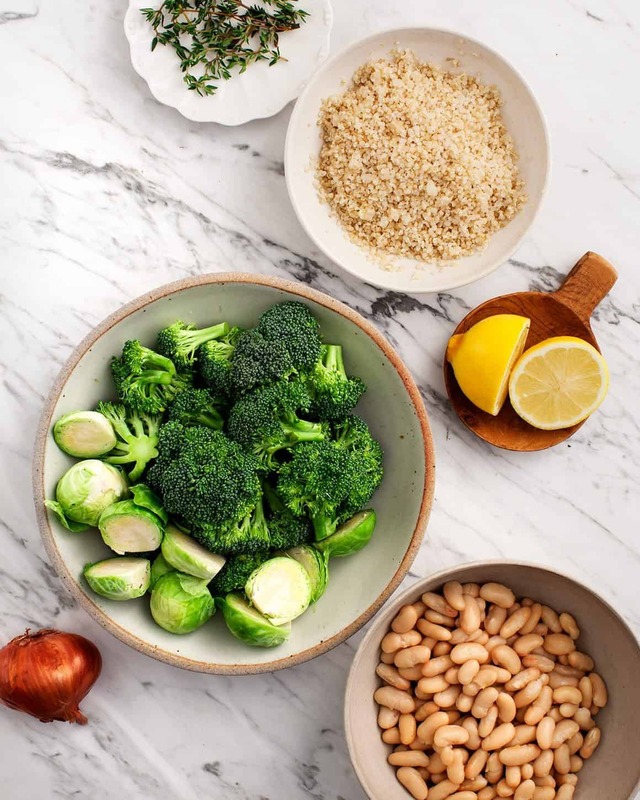 Top it with roasted broccoli and Brussels sprouts, and you have a warm, cozy meal that’s perfect for these remaining chilly spring days. The only thing I added was a clove of garlic and a bigger squeeze of lemon (for obvious reasons). This recipe is from The First Mess Cookbook by Laura Wright and is reprinted with permission from the publisher. 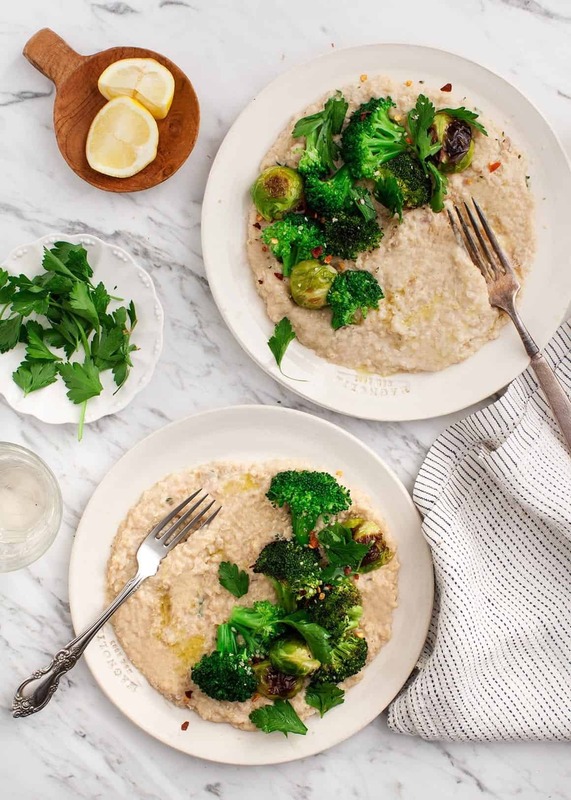 Top this creamy, vegan, and protein-packed take on risotto with your favorite roasted veggies. Place the small florets on the baking sheet. Drizzle with 1 tablespoon of the olive oil, and season with salt and pepper. Toss to coat and slide the baking sheet into the oven. Roast the florets until the edges are evenly brown and crispy, flipping the pieces over occasionally to ensure equal doneness, about 20 to 25 minutes. Set aside. While the florets roast, in a blender, purée the white beans with the garlic, lemon juice, nutritional yeast, 2 teaspoons of the olive oil and ⅓ cup of the vegetable stock. As soon as you have a smooth and creamy purée, stop the blender. Set the bean purée aside. Heat the remaining 1 tablespoon of olive oil in a braiser or medium-sized soup pot over medium heat. Add the shallots, and saute until transluscent, about 4 minutes. Add the fresh thyme and stir until fragrant, about 1 minute. Add the rinsed quinoa to the pot and stir to coat in the oil, herbs, and shallots. Then, add the remaining 2 cups of vegetable stock to the pot and stir. Bring to a boil, then simmer until the quinoa has absorbed almost all of the liquid, about 13 to 15 minutes. Scrape the white bean puree into the pot and stir to combine. The quinoa should have a creamy consistency without seeming dry. 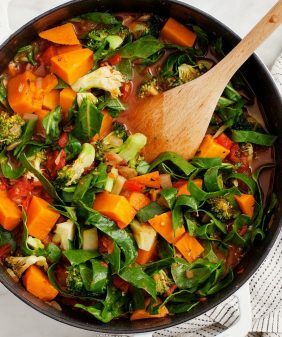 If it seems dry, add a good splash of vegetable stock. That looks so healthy & good! It looks like there is a step missing about pureeing the beans. I think it would be puree them with the garlic, lemon, and nutritional yeast? thanks for pointing that out – just fixed it! Laura’s book really sounds great, as does this recipe. I love the use of white bean puree. Such a clever trick to make it creamy. Beautiful images Jeanine. Pinned! So yummy.. looks amazing, would definitely try and serve my customers… We are a href=”http://www.letsmeetcafe.com/why-cafe-lets-meet/”>best cafe in Jaipur. 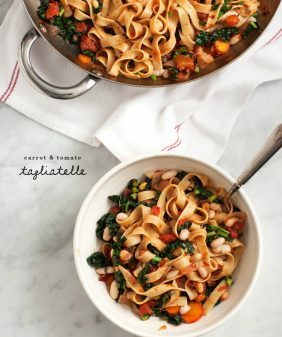 Do you have the nutritional info (carbs mainly) for this recipe? I have the book and love it. thank you for the reminder of this recipe. This looks amazing!! Right now broccoli is not working for me to eat. 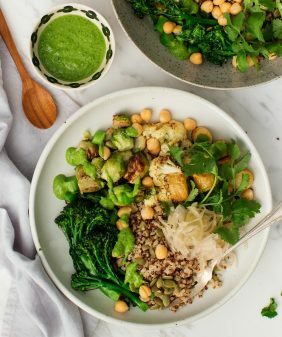 Is there another veggie that would work similarly, like cauliflower? Thanks! I love this recipe and have made it twice. I recommend replacing some of the veggie broth with white wine or dry vermouth – extra good! Hi Dana, ooh, thanks for the tip, that sounds wonderful!